Zhang Yi started collecting ancient Chinese costumes 20 years ago, as a result of a love for ancient silks passed on to her by her mother. Dudou, a sleeveless and backless halter-top blouse, is a traditional Chinese form of bodice, also known as bellyband, which was worn as an undershirt in the past. Located in Muslim Street in Xi'an, Northwest China's Shaanxi Province, the museum attracts many visitors from different countries. 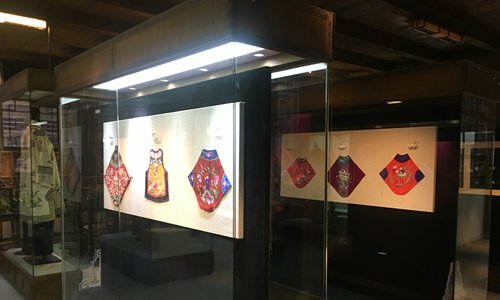 One foreigner was amazed by the unique Chinese costume after her visit, saying, "It fascinates me a lot that there were so many different stories that were told on the undershirts of women through different ages." "In the beginning, I was only thinking how wonderful it would be to get that kind of beautiful embroidery on my clothes when I happened to see a beautiful silk dudou with exquisite embroidery and perfectly matching colors at an antiques market," said Zhang. "That's how I started growing fond of dudou. Later, I learned about the rich culture behind their beautiful appearance." "Dudou appeared from the time people started wearing clothes, and in the Han Dynasty, they were known as 'xinyi' (lit. clothes near the heart)," Zhang explained. 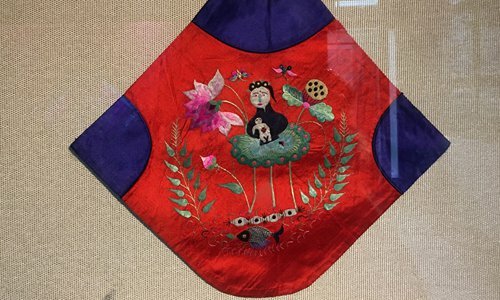 The embroidery on dudou mainly depicts stories or figures from classic Chinese novels and dramas, expressing people's longing for a better life and awe of nature. "The major theme of the embroidery on my collections is praying for children, which coincides with a major theme of Chinese folk culture, as studies show people's beliefs are reflected in the symbols of their daily lives," according to a book written by Zhang. Dudou can also serve as a depiction of folk customs, as it reflects the daily lives of Chinese women in ancient times. 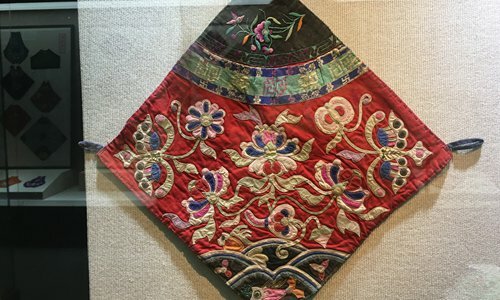 "Women yearned for love, and because most of them couldn't read or write, they expressed their feelings and wishes through their embroidery in a very direct manner," said Zhang. "A woman praying for children would stitch the legend of 'Kylin sends a child,' on her dudou." The appearance of dudou varies according to the era, taking on different shapes such as fans, triangles, crosses, rectangles and trapezoids. Dudou was not a garment worn exclusively by women. "Unmarried women also made dudou for their fiancés," said Zhang. In the contemporary world, dudou has become a fashionable piece seen in many international fashion shows. Inspired by ancient Chinese palace costumes, Chinese designer Guo Pei included dudou in her spring/summer 2019 haute couture collection show held during Paris Haute Couture Week in Paris on January 23. The ancient costume was presented in a Western cutting style, stunning the fashion world. In 2016, Heaven Gaia, a high-end Chinese garment brand, also adopted elements from dudou at the Paris Fashion Week. Suneet Verma, an Indian fashion designer, combined dudou and Indian costumes in his spring/summer collection in 2003. In recent years, it has become fashionable for parents in China to dress their babies in red dudou in summer, as they are beautiful to look at and convenient to wear. Zhang said that people are usually astonished by the level of craftsmanship in ancient China, but she believes it is the little things that touch people's soul. "The museum is unprofitable and more like a charity, but nothing can give me the spiritual power I get from it," said Zhang.